This university swimmer has just completed her freestyle left arm entry. (The vertical gray lines on the force curves are synchronized with the video image.) 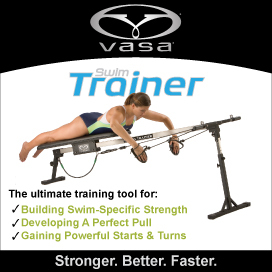 The Aquanex analysis shows that her arm is in a weak and awkward position to begin the pull because her hand is above her elbow. She wastes about .2 sec generating very little force until her hand submerges below her shoulder where she can then substantially increase force.